John holds the rank of Godan (5th degree) in Aikido. He started practicing Aikido in 1978 at Andover Aikido. For many years he ran the youth program at Northeast Aikikai in Chelmsford. He studied Aikido under Sensei Newcombe, Sensei Kanai, and Sensei Perriello. John also practices iaido, kendo, and archery. 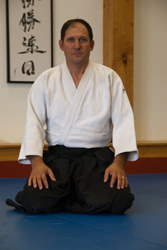 With the solid and kind support of Sensei Perriello, John founded the Methuen Aikido dojo (2002). John dedicates many hours of his life each week to support and develop the Ki Rei Shinkan Aikido community. He finds the results of that work very rewarding. Wood Sensei received the rank of Yondan in 2008 and has studied under Lou Perriello Sensei since 1988. Mike began teaching in 1995 and ran the Brandies University School for 8 years. He has had the opportunity to train briefly at a few schools in Japan and with martial artists of varying disciplines at the USMA seminars. Off the mat, Mike is a father, computer programmer and Reiki practitioner. Guven-san started practicing Aikido in 1984 in Istanbul Turkey under Kenji Kumagai Shihan. Prior to 1980 there was no Aikido in Turkey. When Kumagai Shihan moved to Turkey on business, he was assigned by Hombu Dojo as Shihan to Turkey and planted the roots of Turkish Aikido. Today Aikido is thriving under the leadership of Kumagai Shihan and his senior students. Guven-san received his Shodan from Kumagai Shihan on 1986 in Turkey. When Kumagai Shihan moved back to Japan Sensei Guven was presented with an opportunity to go to Japan. He lived in Japan from 1989 to 1991 and primarily practiced at Hombu Dojo under Tada, Watanabe and Endo Shihans’ instruction. He was also fortunate to attend classes of Kisshomaru Ueshiba (then Doshu) and Moriteru Ueshiba (current Doshu). Apart from Hombu Dojo Sensei Guven frequented Omiya Dojo (in a suburb of Tokyo) and practised under Ichitsuke Sensei. At Kumagai Shihan’s insistance, Sensei Guven tested at Hombu Dojo for his Nidan rank. He was promoted prior to his leaving Japan in 1990. After leaving Japan, Sensei Guven came to the United States and briefly practiced in Honolulu, Hawaii and Cambridge, MA. Since 2005, he has continued his Aikido practice at Ki Rei Shinkan Aikido. 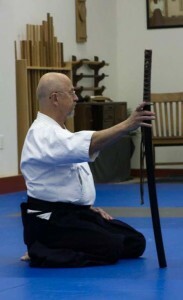 Sensei Markauskas founded the Iaido Program for our students in 2005 at Methuen Aikido. He started studying martial arts in 1972. He studied in the “Japanese Swordsmanship School” Doshi Kai Kendo and Iaido dojo. 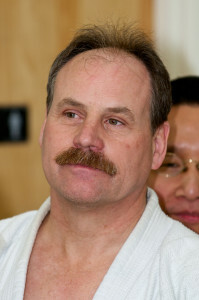 Sensei Markauskas currently holds nidan (2nd degree blackbelt) rank in Iaido awarded by the All US Kendo Federation (AUSKF) in 1999. He is trained in Sietei-Gata Iaido and Eishin-Ryu Iaido. Sensei Markauskas also holds rank in Uechi-Ryu Karate, Shotokan Karate and officiates at Karate and Kickboxing tournaments throughout the United States. Because of his tremendous efforts and his wonderful teaching skills, Sensei Markauskas prepared Sensei Jamie Proctor to take over routine instruction thereby enabling our dojo to continue to offer a strong iaido program from which to learn . Sensei Rev. Jamey Proctor leads the Iaido classes at Ki Rei Shinkan. He holds the degree of shodan in Iaido. 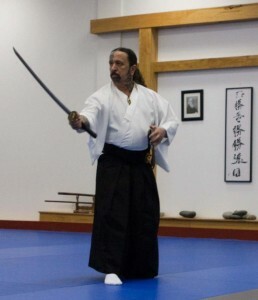 He started his study of Iaido under the instruction of Sensei Alex Markauskas at Methuen Aikido in 2008. 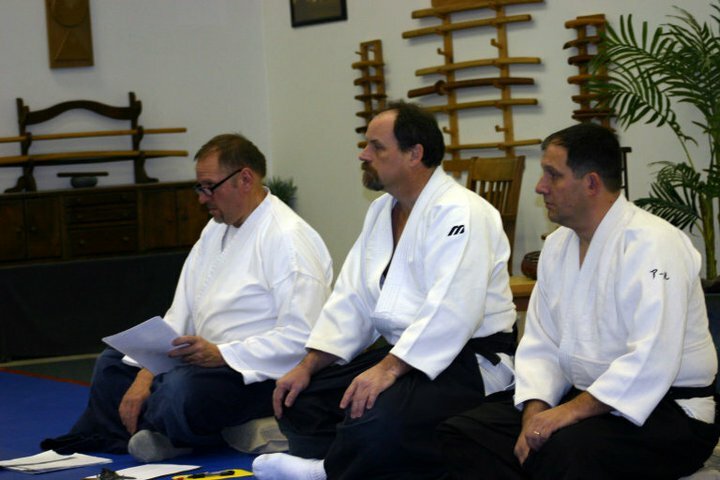 When Sensei Markauskas retired in 2013, Proctor sensei was honored to take over the Iaido program. Reverend Proctor started training in martial arts 1974. He studied Tae Kwon Do for many years and later he expanded his study to include sword training, archery, and other extensive weapons training. He strives to keep his students interested in technique, theory, and application. Many mentors and leaders within the student ranks help make our community inviting, rich, and enjoyable for everyone. They are a vital asset to our dojo.